A vulnerable teenager in west Belfast was recruited by the PSNI as an informer and then put under pressure to plant explosives and weapons on his neighbours, it has emerged. The terrified nineteen-year-old Thomas Boyle, who has a history of self-harm, came forward to the media with a shocking account of PSNI abuse and illegality. He said he was recruited last year after being arrested for shoplifting. He was then forced to plant tracking devices under the cars of prominent ‘dissident’ republicans at the behest of PSNI Special Branch and was even asked to plant a gun in a neighbour’s car and Semtex explosive in another neighbour’s shed. Boyle confessed to his activities alter becoming afraid that he was “in over his head”. Security sources are reported to have confirmed that Boyle had been working for the PSNI since last year. The west Belfast teenager said he was prompted to confess after becoming afraid he was being coerced into carrying out ever more dangerous activities by his police handlers. “They said smash the side window and make it look like I was trying to steal [the car] and then leave the gun so they would find it when investigating the break-in. “I met one man a few times at the top of the Whiterock [Road]. He gave me money and mobile phone SIM cards. “He told me they were going to give me Semtex and wanted me to put it the garden shed of a man. “If I didn’t they said I was going to be done with making hoax bomb calls and would get seven years [in prison]. They said they could pin other charges on me any time they wanted. He was also ordered to try and join the dissident group Oglaigh na hEireann so he could report back on their activities. In return, the PSNI promised him thousands of pounds -- although he was only ever paid fifty pounds. 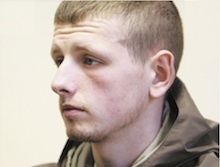 Oglaigh na hEireann said it had interrogated Boyle and released him over the weekend. PSNI and British army helicopters had been visible over west and north Belfast as they undertook a massive search for their teenage informant. In a statement the group said the teenager had contacted them willingly. “He is alive to tell his tale for a number of specific reasons, including the fact that he is quite plainly vulnerable and has fully admitted his covert activities,” it said. The breakaway IRA group warned other informers to come forward. “If we discover other agents in the future then the penalty will be death,” its statement read. Sinn Fein Policing Board member Alex Maskey said that any use of informers against republicans should be ‘open to thorough scrutiny’. “Using informers would be standard practice for police services the world over,” he said. “However, we obviously have a polluted history of politicised activity which has often seen the use of agents provocateurs. “I have no knowledge of this particular case but there has to be proper protocol and any allegations such as this need to be scrutinised,”he said. Suicide prevention campaigner Phil McTaggart said the use of vulnerable young people as informants by the PSNI was a “disgrace”. He advised any young person who is in a similar predicament as Boyle to seek help. Carl Reilly of the Republican Network for Unity warned that people may have been charged by the PSNI on the back of evidence planted by an informer. “Once again the re-branded RUC has destroyed its carefully contrived facade of normal civil policing by manipulating a young person to become an Informer and spearhead a British dirty tricks campaign in an attempt to whip up anti-republican hysteria in Belfast,” he said. He called for an independent investigation.